Clueless Escape Rooms was established in 2016 with the goal of delivering engaging escapes that would make people smile and bring them closer together. Escape games are a new, exciting way to challenge your mind and have fun at the same time. Players are put in a themed room and must solve a series of riddles and puzzles, by using clues and hints they find. Escape rooms are ideal for friends, family, birthday parties, holiday parties, and team building events. Clueless Escape Rooms allows professionals to test their team in one of three premium escape room scenarios: Football Fury, Candy Caper, and the head-to-head “Save Tony” experience, where two teams battle each other, and the clock, in separate but identical rooms. Our newest and most immersive room will be opening in November, “Castaway Island”. Escape the harsh Michigan weather while you play the only room in Michigan that contains over 5,000 lbs. of sand! All our escapes are 100% unique, designed and built by our team. Our escapes provide fun and challenging activities that foster communication, collaboration, problem solving, and bonding. Players must work together to successfully escape in the allotted time. It’s amazing to see what co-workers can learn about one another in a room over the course of an hour! A variety of local businesses have sent teams though our rooms: the University of Michigan, IHA, DTE Energy, Comerica Bank, St. Joseph Mercy Health System, Dominos, Orange Theory Fitness, and more. Wouldn’t your business benefit from a stronger team? 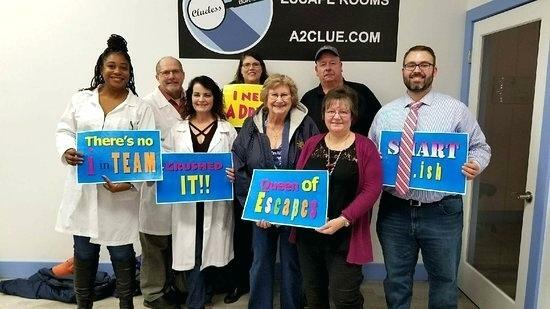 Bring your team to Clueless Escape Rooms for a professional development day! To learn more visit our website at: A2clue.com, or call us at:734-260-9180.